Edinburgh Monarchs have given themselves a fighting chance of reaching the Championship KO Cup final after taking control of tonight’s semi-final first leg tie against Workington Comets at Armadale Stadium. Edinburgh Monarchs have given themselves a fighting chance of reaching the Championship KO Cup final after taking control of last night’s semi-final first leg tie against Workington Comets at Armadale Stadium. Monarchs romped to a 59-31 success which puts them firmly in the driving seat ahead of tomorrow night’s return leg at Workington’s Derwent Park. The pressure is now on the Comets to produce something special to deny Monarchs a last chance of silverware this season following their exit from the play-offs. Monarchs did not get off to the best of starts when Ricky Wells and Victor Palovarra got into a spot of bother in the first heat which allowed Comets star Rasmus Jensen to nip in and win the race from under their noses and win a 3-3 share of the spoils. And the Comets also won the second race when Mason Campton headed home Monarchs’ reserve pairing of guest rider James Sarjeant and William Lawson for another 3-3 which tied the scores. Already the Comets were signalling their intentions that they were not going to be steamrollered as they were back in August. Josh Pickering touched the tapes in the third race and had to start from 15 metres back and could only finish last, and Monarchs team-mate Richie Worrall won the race but a third 3-3 on the bounce suited Workington much more. Monarchs finally grabbed the lead in the fourth heat with a 4-2 from skipper Riss and Sarjeant to lead 13-11. And Monarchs pulled further clear in the next heat with a 5-1 from Worrall and Pickering, despite Worrall receiving a warning from the referee for moving at the start. But Monarchs now led 18-12 and were starting to look more dominant, and a second 5-1 followed for Monarchs in the sixth race when Wells and Palovaara held off Ty Proctor and Kyle Bickley to stretch their match advantage to ten points, 23-13. Another 3-3 was grounded out by Riss in the next heat which maintained Monarchs’ lead, and furnished Riss with his second win of the night. Palovaara tumbled off on the fourth bend in heat eight and was disqualified from the rerun leaving Sarjeant as the lone Monarch against Comets pair Jensen and Campton. Sarjeant did well to finish in second place, but the Comets secured a 4-2 to cut their arrears to eight points. Worrall and Pickering secured their second 5-1 of the night and Monarchs’ third maximum advantage of the meeting to keep Monarchs well in the hunt and the home side now led 33-21. It was Worrall’s third race win on the bounce and he was flying. Wells won his second race of the match in heat ten and, with Palovaara in third place, this 4-2 placed Monarchs 37-23 but they couldn’t quite shake off the Comets yet. 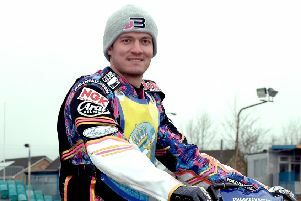 Comets’ Danish ace Rene Bach then took ill in the pits and was withdrawn from the meeting which was an undoubted blow to the visitors even though he had only scored three points from his two rides. Riss collected his third race win of the meeting in the 11th race and with partner Lawson finishing in third place this 4-2 pushed Monarchs further in front to 41-25. Pickering then rode a tremendous race to pip Comets guest rider Kevin Doolan on the line in heat twelve for a brilliant 4-2 which pushed Monarchs further ahead 45-27 which had a deflating effect on the visitors. A 5-1 from Riss, his fourth race victory, and Wells in heat 13 saw Monarchs hit 50 points. A further 4-2 followed for Monarchs courtesy of Worrall and Sarjeant in the penultimate heat to lead 54-30 with a place in the final looking a distinct possibility. Riss completed a 15-point maximum in the final heat when he defeated Jensen, and with Worrall following Riss home this 5-1 saw Monarchs finish in style with a handsome first-leg victory. Monarchs: Riss 15, Worrall 14, Wells 9, Pickering 7, Sarjeant 7, Palovarra 5, Lawson 2. 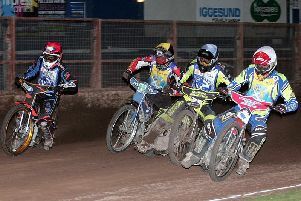 Workington: Campton 8, Jensen 8, Doolan 7, Proctor 5, Bach 3, Bickley 0, Klindt 0.